After two years of feedback with professional athletes we are proud to bring you the AIRhub PRO. Designed for riding in bad weather with simple consistent operation. A single switch at the axle controls 2 different levels of resistance. No Bluetooth. No Smartphones. Just next level training. 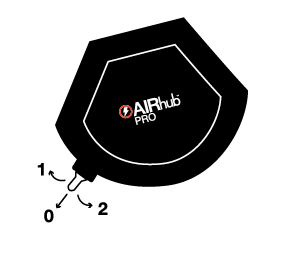 The AIRhub Pro adds resistance based on speed. The faster you go the more resistance is applied. Level 1 adds 1 watt of resistance per Kilometer per hour of road speed. Level 2 adds 2 watts per kilometer per hour. 2 w/kmh equates to a 1% grade on every road. The AIRhub Pro is designed to make you a better you. With the slightest increase in resistance you will begin to see monthly gains in average riding power. We recommend a slow progression from no resistance, to Level 1 and on to Level 2. As with all training, progressive overload is key. The progressive loading from increasing your average riding power is massive. While you barely notice it at the time, by the end of the week you will feel like you have spent every day in the gym.